Product prices and availability are accurate as of 2019-04-19 00:36:24 EDT and are subject to change. Any price and availability information displayed on http://www.amazon.com/ at the time of purchase will apply to the purchase of this product. 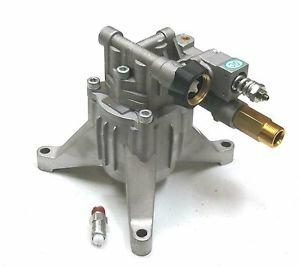 BRAND NEW PRESSURE WASHER PUMP. FITS MANY BRANDS SUCH AS KARCHER, GENERAC, BLACKMAX, CRAFTSMAN, BRIGGS, HONDA, POWERSTROKE, and OTHERS! 2400-2700 PSI, Flow Rating of 2.4 GPM, with 7/8" and 3 mounting holes. INCLUDES THERMAL RELEASE VALVE. SPECS: FITS 7/8" Inch (22.225mm) SHAFT VERTICAL CRANK ENGINES. MOUNTING BOLTS: FROM MAIN CENTER SHAFT TO EACH MOUNT BOLT IS 4" - CENTER TO CENTER SPACING BETWEEN MOUNTING BOLTS IS: 7 11/16" - 6 3/16" - 6 7/16"
FITS MANY BRANDS SUCH AS KARCHER, GENERAC, BLACKMAX, CRAFTSMAN, BRIGGS, HONDA, POWERSTROKE, and OTHERS! 2400-2700 PSI, Flow Rating of 2.4 GPM, with 7/8" and 3 mounting holes. INCLUDES THERMAL RELEASE VALVE SPECS: FITS 7/8" Inch (22.225mm) SHAFT VERTICAL CRANK ENGINES MOUNTING BOLTS: FROM MAIN CENTER SHAFT TO EACH MOUNT BOLT IS 4" - CENTER TO CENTER SPACING BETWEEN MOUNTING BOLTS IS: 7 11/16" - 6 3/16" - 6 7/16" Please Compare The Picture With Yours Before Purchasing.